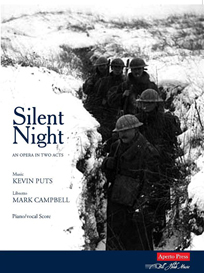 Silent Night is an opera in two acts by composer Kevin Puts and librettist Mark Campbell, based on the 2005 film Joyeux Noël, directed by Christian Carion and produced by Nord-Ouest Production. Commissioned by Minnesota Opera with co-producer Opera Company of Philadelphia, it opened on November 12, 2011 at the Ordway Theater, St. Paul Minnesota to great critical acclaim and standing-room-only houses for the entirety of its run. The opera is sung in English, German, French, Italian and Latin. War is declared. At a Berlin opera house, the announcement disrupts the careers and personal lives of international opera singers Anna Sørensen and Nikolaus Sprink. In a small church in Scotland, it inspires dreams of heroism in William who demands that his younger brother Jonathan immediately enlist with him as their priest, Father Palmer, looks helplessly on. In the apartment of the Audeberts in Paris, it angers Madeleine who excoriates her husband for leaving to fight while she is pregnant with their first child. Amid the fervor of nationalistic songs, the men prepare to leave for war. A horrific battle is fought between the Germans and the French and Scottish. An attempt by the French and Scottish soldiers to infiltrate the German bunker fails miserably; corpses begin to pile up in the no-man’s land between the three bunkers. Nikolaus is seen violently engagingin combat--stabbing a man to death and growing in despair at the violence. William is shot, Jonathan must leave his brother behind to die. In the Scottish bunker, Lieutenant Gordon assesses the casualties after the battle. Father Palmer attempts to offer solace to Jonathan in prayer. In the French bunker, Lieutenant Audebert discovers the French General waiting in his makeshift office, who reprimands him for surrendering and threatens him with a transfer. The General leaves and Audebert laments the loss of his wife’s photograph to his aide-de-camp, Ponchel. When he is alone, Audebert tallies the casualties in the last battle, while missing Madeleine and their child who he has not yet seen. He sings of needing sleep, a sentiment echoed by all of the soldiers. As it starts to snow, covering the corpses in no man’s land, the soldiers slowly begin to sleep. Alone in the German bunker, Nikolaus reveals to an imagined Anna his despair about war. In the German bunker, crates have arrived – and little Christmas trees from the Kronprinz. Lieutenant Horstmayer criticizes the Kronprinz for not sending them more useful presents, like ammunition and reinforcements. He receives a directive from headquarters that Nikolaus has been ordered to sing at the nearby chalet of the Kronprinz, along with one Anna Sørensen. Nikolaus departs for the chalet, excited that he will be reunited with Anna again after many months apart. The French soldiers have received crates of wine, sausages and chocolates from the quartermaster and open them jubilantly. Ponchel, a barber by trade, brings coffee to Audebert and sits him down for a haircut. He is reminded of having coffee with his mother every morning, who lives only an hour away by foot. The alarm clock he carries next to his heart at all times (which shielded him from a bullet in the last battle) rings at ten o’clock every morning to remind him of their daily meeting. In the Scottish bunker, crates of whiskey have arrived from home. Jonathan writes a letter to his mother, not mentioning his brother’s death. At the chalet of the Kronprinz, Anna and Nikolaus perform a duet. Following the performance, they steal a few moments on a terrace outside. Anna notices the cruel effect war has had on her lover’s spirit. She has arranged for Nikolaus to spend the night with her and is angry when he says he must return to his fellow soldiers. She vows to accompany him back to the battlefield. In the French bunker, Gueusselin volunteers to infiltrate the German bunker, and with several grenades, sidles onto noman’s land. The Scottish soldiers drink whiskey and play a bagpipe that another unit has sent them, as Father Palmer sings a sentimental ballad about home. The men in the other bunkers hear the song and react to it with sadness, caution and annoyance. Nikolaus arrives; his fellow soldiers greet him with cheers and applause and gasp in amazement at seeing Anna with him. When the song in the Scottish bunker is finished, Nikolaus sings a rousing Christmas song loudly in response and midway through the bagpiper begins to accompany. Emboldened, Nikolaus stands atop the bunker raising a Christmas tree as a gesture of friendship. Against the protestations of their superiors, the soldiers from all bunkers stand. Nikolaus bravely moves to the center of no-man’s land. Gueusselin abandons his plan to grenade the German bunker. Eventually, the three lieutenants, waving a white flag of truce, agree to a cease-fire … but only on Christmas Eve. The soldiers slowly and cautiously move toward each other. They share their provisions, their photos and their names. Anna appears and all of the soldiers are awed by the sight of a woman. Father Palmer has set up a makeshift church and celebrates mass with the men, while Jonathan finds his brother’s body and vows revenge. Father Palmer finishes the mass and urges the men to “go in peace” as bombs explode menacingly in the distance. The following morning, Jonathan tries to bury his brother. Because the truce is officially over, two German sentries are prepared to shoot him, although Father Palmer and Lieutenant Gordon intervene. Looking on, Horstmayer proposes that it may indeed be time to bury all of the dead. The three lieutenants meet and decide over coffee that the truce will be extended until after the dead in no-man’s land are buried. The soldiers pile up the corpses, Father Palmer delivers last rites and the soldiers form a processional bearing the wagon of bodies away. Anna looks on with Nikolaus and promises that he will not suffer the same fate. In the meantime, news of the cease-fire has reached headquarters, and the British Major, the Kronprinz and the French General all react in anger and disbelief. They declare that they will punish the soldiers for their betrayal. Lieutenant Horstmayer prepares to return to war and Nikolaus berates him for his allegiance to the Fatherland. Horstmayer arrests Nikolaus for insubordination, but Anna takes his hand firmly and leads him across no-man’s land as Horstmayer orders his men to shoot, but no one moves. Reaching the French bunker unharmed, Nikolaus regains his voice and demands asylum for he and Anna. The British Major admonishes the Scottish soldiers for participating in the Christmas truce. They are to be transferred to the front lines. When a German soldier is seen crossing the battlefield, the Major orders him killed. Jonathan complies and dispassionately shoots the man. Lieutenant Audebert returns to his small office and discovers the French General there. The General tells Audebert that he will be transferred to Verdun as punishment for consorting with the enemy and that his unit will be disbanded. Audebert informs the French General – his father – that he has learned he has an infant son named Henri. They vow to survive the war for the child’s sake. The Kronprinz angrily announces that the German soldiers are to be deployed in Pomerania as punishment. As the soldiers are taken off in a boxcar, they hum the Scottish ballad they heard in the bunker on Christmas Eve. The battlefield is now completely empty. Snow begins to fall again.